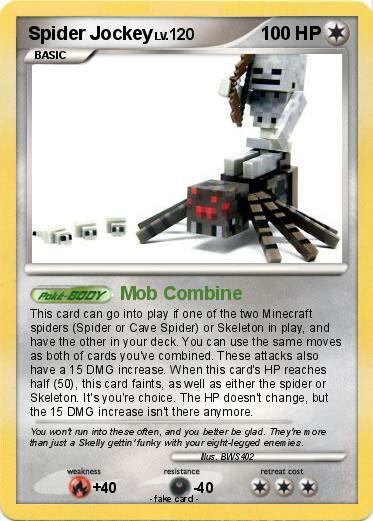 This card can go into play if one of the two Minecraft spiders (Spider or Cave Spider) or Skeleton in play, and have the other in your deck. You can use the same moves as both of cards you've combined. These attacks also have a 15 DMG increase. When this card's HP reaches half (50), this card faints, as well as either the spider or Skeleton. It's you're choice. The HP doesn't change, but the 15 DMG increase isn't there anymore. Comments : You won't run into these often, and you better be glad. They're more than just a Skelly gettin' funky with your eight-legged enemies.